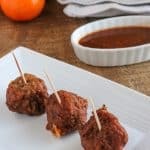 My mouth is watering already for these Instant Pot Spicy Orange BBQ Meatballs! Serve them over white rice for a complete meal the whole family will be happy with! Turn pressure valve to sealed and cook on the manual pressure setting (or pressure cook on new models) 6 minutes. When timer is up, preform a quick release of pressure. Serve as a main course over rice, appetizer, or even as a side with dipping sauce.